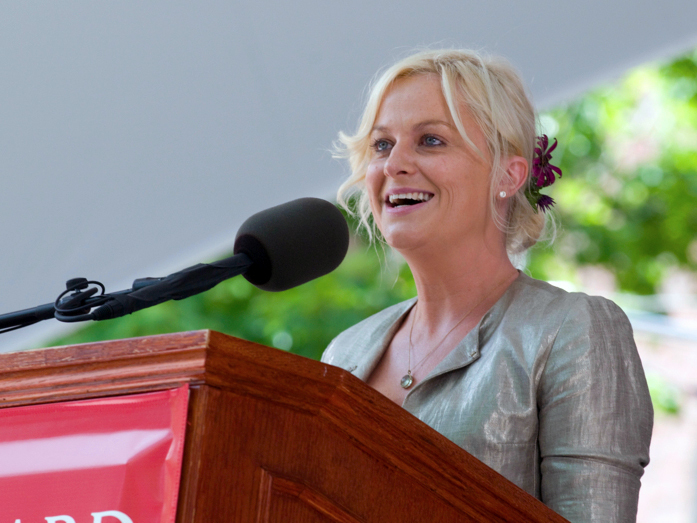 "I'm truly, truly delighted to be here at Harvard," comic actress Amy Poehler told the crowd of graduating seniors and their parents at Class Day on May 25. (Scroll down to view the video of her speech.) 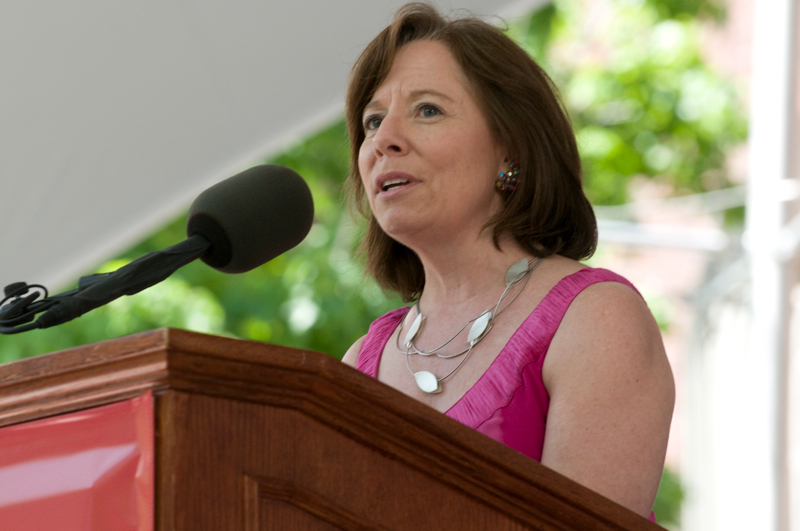 "I graduated from Boston College, which some call 'The Harvard of Boston,'" she deadpanned. The star of the television comedy Parks and Recreation, who rose to prominence as a result of her work on Saturday Night Live opposite Tina Fey, treated her audience to a stream of jokes, assumed accents, and perfectly timed punchlines centered on Harvard's reputation. But Poehler also had a serious message, based on her own experiences: "What I have discovered," she said, "is this: You can't do it alone." The message was partly about humor, but also about humility. "As you navigate through the rest of your life, be open to collaboration. Other people and other people's ideas are often better than your own. Find a group of people who challenge and inspire you, spend a lot of time with them, and it will change your life. No one is here today because they did it on their own…You're all here today because someone gave you strength. Helped you. Held you in the palm of their hand. God, Allah, Buddha, Gaga—whomever you pray to." Poehler, while cautioning the class against pursuing a career in acting (there is "no room at the inn," she said), shared some rules that she learned while studying improvisational acting in Chicago: "Listen. Say 'yes.' Live in the moment. Make sure you play with people who have your back. Make big choices early and often." "The answer to a lot of your life's questions is often in someone else's face," she continued. "People's faces will tell you amazing things. Like if they are angry, or nauseous, or asleep…Try to keep your mind open to possibilities and your mouth closed on matters that you don't know about. Limit your 'always' and your 'nevers.' Continue to share your heart with people even if it has been broken." In a nod to the parents in the audience, Poehler implored the class to indulge them a little: "Less eye-rolling, please." "This is what I want to say," she concluded. " When you feel scared, hold someone's hand and look into their eyes. And when you feel brave, do the same thing. You are all here because you are smart. And you are brave. And if you add kindness and the ability to change a tire, you almost make up the perfect person." 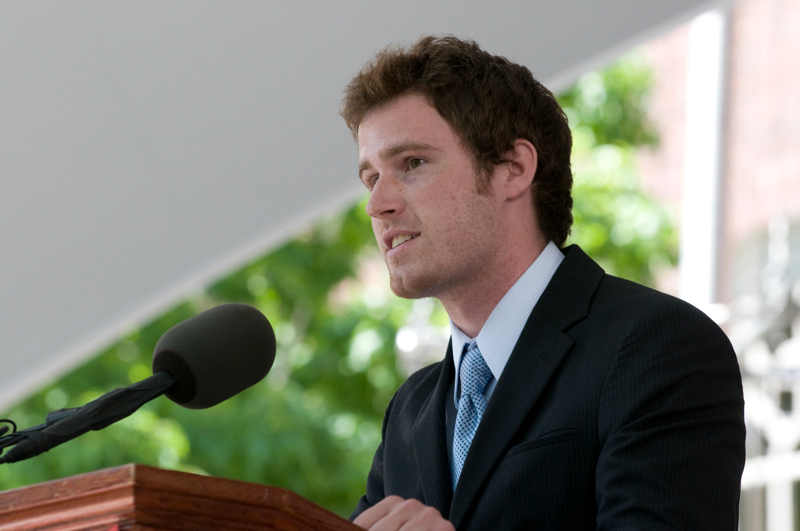 Poehler's speech was preceded by a Harvard oration by Timothy J. Lambert '11, a resident of Pforzheimer House from Massachusetts, who has written for the Harvard Crimson. 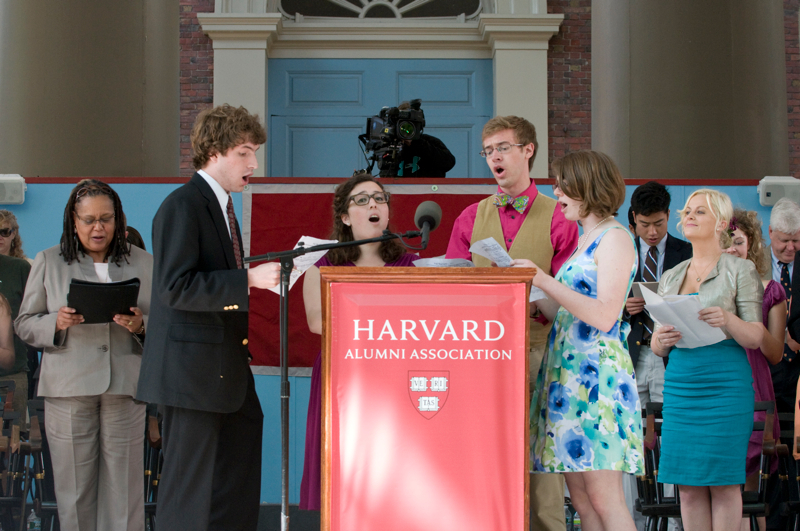 Lambert spoke about love/hate relationships and Harvard. 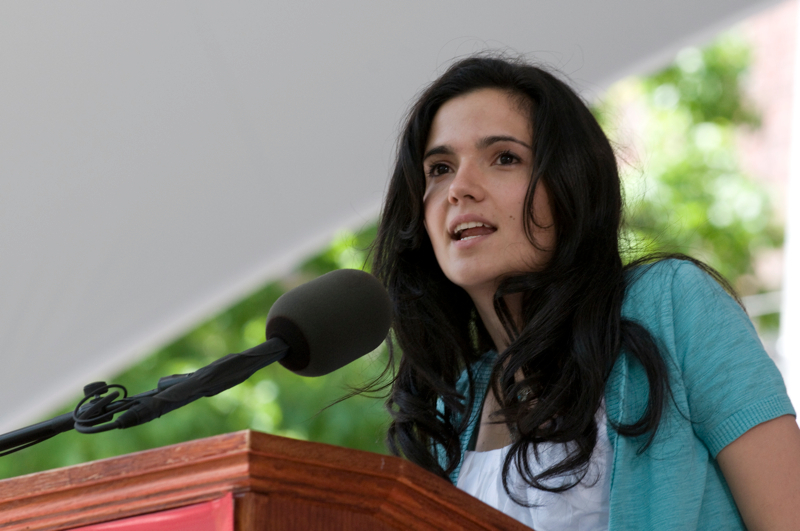 Laura Jaramillo '10-'11, also of Pforzheimer House, and from Colombia, gave the other Harvard oration. 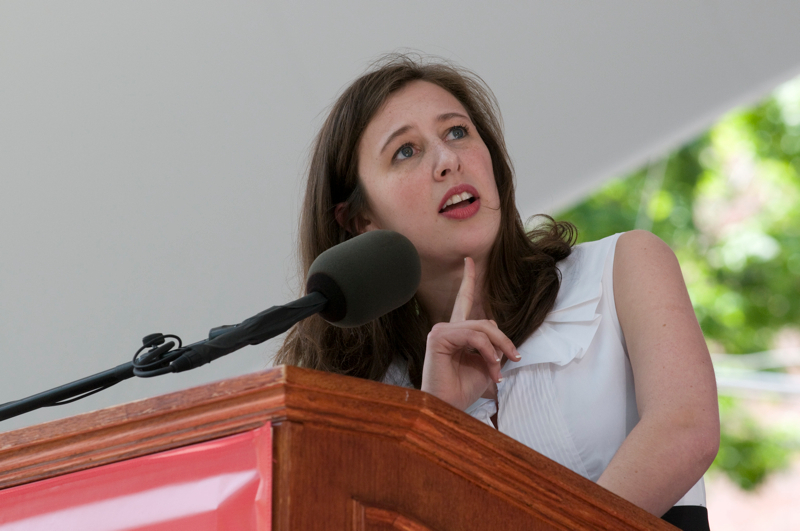 A government concentrator and the recipient of a 2011-2012 Rockefeller Fellowship which she plans to use for travel to France, she spoke about the sacrifice of her pet cow, Claramanta, to finance her early education. 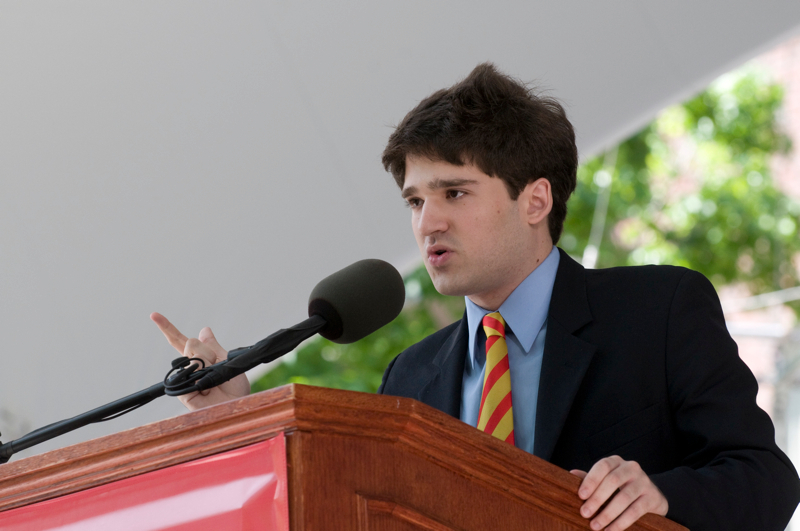 Molly Fitzpatrick of Winthrop House and Scott Levin-Gesundheit of Mather House delivered the two humorous Ivy orations.